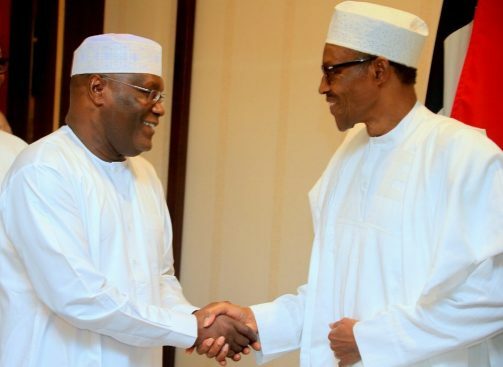 President Muhammadu Buhari of the All Progressives Congress (APC) and former Vice President Atiku Abubakar of the Peoples Democratic Party (PDP) will today sign a peace accord on the outcome of the February 16 presidential election. Former US President Bill Clinton will also speak with Buhari and Atiku this week to ensure peaceful election, his spokesman Angel Ureña said in a statement. Clinton was earlier billed to deliver keynote address and witness the signing of the peace accord organised by the National Peace Committee (NPC) led by former Head of State General Abdulsalami Abubakar. The former US president however cancelled the trip because his visit to Nigeria “has the potential to be politicized in a way that is not in line with the goals of the Committee,” Ureña said. “This is a crucial time in Nigeria, and President Clinton is hopeful that the election’s outcome reflects the will of the Nigerian people,” the spokesman added. Mr. Paul Ibe, Atiku’s media aide, also confirmed to Daily Trust yesterday that the former VP would sign the pact today. President Buhari had on December 11, 2018 signed the first peace pact, tagged “Abuja Accord 2018” along with several other presidential candidates. The PDP candidate who was absent at the event however signed the pact the following day. Also, after signing the pact, Atiku commended the president for signing the peace agreement. Daily Trust reports that in the build up to the 2015 elections, the NPC facilitated the signing of the peace accord between then President Goodluck Jonathan, Buhari and 12 other candidates for the presidential poll. Speaking to the Daily Trust in a phone interview earlier, the convener of the NPC and Catholic Bishop of Sokoto Diocese, Matthew Hassan Kukah said the focus of first peace accord was on the conduct of politicians during campaigns, the second would be on acceptance of the poll’s result if the election is free, fair and credible. He added that it was left for the political parties, presidential contestants and other candidates to act within the law and spirit of the National Peace Pact. The PDP had on Wednesday, February 6 threatened to opt out of the first accord after accusing the ruling APC and its members of breaching the terms of the accord, but the APC campaign denied the allegations. Daily Trust reports that 42 political parties had on Monday given eight conditions that must be included in the accord before signing it. The position was contained in a statement on behalf of the parties by the Chairman of Action Peoples Party, Imo Ugochinyere; National Chairman of Alliance National Party, Mashood Shittu; National Chairman, People’s Coalition Party, Anthony Harmattan; and National Chairman, Action Alliance, Kenneth Udeze. They are: “The conditions are that it must be included in the accord that security agencies should not arrest leaders of the opposition parties few hours to election, as was done in Osun governorship election. “The Independent National Electoral Commission (INEC) and security agencies must not exclude opposition parties’ agents from collation venues, from Polling Unit to the final collation level. “It would be a breach of the accord for any security agency to arrest agents of opposition parties or stop them from accessing the venue of election and collation. “Accreditation must be done with party agents physically monitoring the identification of the voters. “INEC should be allowed by security agencies to do their work without interference in accordance with Electoral Act, 201, as amended. “No result shall leave the polling unit without being announced and pasted on the wall, in accordance with the Electoral Act, as amended.